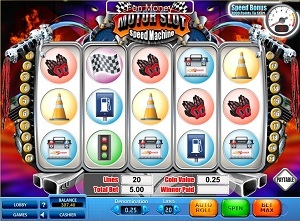 SkillOnNet has managed to develop a high quality slot machine that will suit all motor lovers out there. Motor Slot Speed Machine delivers some of the most enjoyable gaming experiences that you can get. Imagine the combination of high speed, loud rock n’ roll music and the excitement of spinning the reels all together! Motor Slot Speed Machine has 5 reels that are covered by 20 pay lines for you to bet on. While you’re driving this bad boy down the street you will have the opportunity to enjoy both free spins and bonus features. You can win up to 20 free spins with a X2 multiplier! There is no reason for you to be bored; Motor Slot Speed Machine will entertain every sense you have and make sure that you get on of the best gaming experiences available! This is the deal: when you click on the “Spin” button the background of the game window will start moving as if you are sitting on a motorcycle and pressing the gas. The drive-feel in this slot is great and it adds to the fantastic gaming experience that Motor Slot Speed Machine delivers. The colouring of this slot machine is very easy on the eyes; a dusk red colouring as if you are driving your motor cycle in the evening. The music in this slot machine is very suitable to the theme. You will hear different rock n’ roll tunes, depending on your play. If you are lucky enough to hit some free spins you will notice how the music changes to a more up-beat type of guitar based heavy metal music. You can easily state that the graphics and sound is 100% in consistency with the motor cycle racing theme of Motor Slot Speed Machine. All symbols in this slot machine are themed related. There are no card deck symbols to substitute for lack of imagination. The lower paying symbols in this game is the typical motor cycle racing accessories like driving gloves, tool box, gas pump, start lights, driving suit, wheels and the checkered finishing flag. The wild symbol is the speedometer and this symbol will substitute for all other symbols except for the scatter and the bonus symbol. The bonus symbol is the racing helmet symbol and the scatter symbol is the tool symbol. All symbols pay left to right with the exception of the Scatter and Bonus symbol. Every time the Bonus symbol appears anywhere on the reels you will get 100 bonus points. Once you have earned 1000 bonus points you will trigger the Speed bonus game. The aim of the bonus game is to guess which of the racers will win the race. Simply click your chosen racer and the race will begin. There are different prizes for achieving place 1, place 2 and place 3. 1 Scatter symbol awards 1 free spin. 2 Scatter symbols award 2 free spins. 3 Scatter symbols award 5 free spins. 4 Scatter symbols award 10 free spins. The free spins have a X2 multiplier. Motor Slot Speed Machine has 5 reels and 20 pay lines for you to bet on. You can easily set your bet preference by using the + and – button in the lower part of the gaming window. The minimum bet per line is 0, 01 casino credits and the maximum bet per line is 10. « More slotmachines guides Article last updated: Friday, July 13, 2012.